And if you’re okay with that, let’s talk. If you could do without the inspirational branding of being a better you, or the aspirational promises of hard and fast transformation, then we can have a real conversation. We can look together at the process of yoga teacher training for what it is; a concentrated time of learning and engaging with yourself and with a community. A lot of YTT marketing that I see rubs me the wrong way. It seems to promise spiritual, emotional and career transformation in a one-shot deal. And, I get why people are drawn to it. Who doesn’t want a quick fix? Who doesn’t want that promise fulfilled? The squeaky wheel gets the grease, right? Ever since my 200 hour YTT ended, I’ve been squeaking away about wanting another opportunity to learn in relationship with others, in community. I remember how awesome it was to move, observe and discuss the intricacies of anatomy, philosophy and politics with a diverse group of people, and I miss that. I’ve kept on learning on my own, and while self inquiry and practice is important, it’s just not the same thing, watching videos on my laptop and farting around on my mat at home. Good news: with the announcement of the Queen Street Yoga Teacher’s Immersion, Leena and Emma have just greased up this squeaky wheel big time, and now I’m swirling like a merry-go-round! I know what it’s like to learn at QSY because I did my initial 200-hour training there, and what I experienced was excellent pedagogy, diverse and forward-looking perspectives, and outside experts brought in with intentionality and purpose. Beyond that, Leena and Emma are masterful at holding space, nurturing community and guiding both individual and group learning with consistent and clear support and care. The way they lead trainings with both wisdom and curiosity, experience and reflection is inspiring and makes for a true learning community. When I did my teacher training, I had to travel. Not to glamourous locations like Costa Rica or India, but to small studios in freezing Winnipeg and land-locked Cincinnati. I travelled because I am picky – I knew who I wanted to study with, and I was willing to go the distance. I slept on couches, spent hours on Greyhound buses. One time I even got turned away from the US border (that is a story for another day). It was exciting to see new places and learn new things, but it was also a slog. I experienced wonderful bonds and community with the people in my trainings (200hr and beyond), but it was hard to sustain the excitement and conversation once I returned home. Leena was the only other yoga teacher in KW that was studying the same type of yoga as me. So for a long time, it was just her and I, talking about teaching and practicing together. Leena and I took over the leadership of Queen Street Yoga in 2012 and since then, have created the kind of yoga teacher trainings that we wish we could have taken. Leena also travelled a lot for training, and while it was cool for her to study with Ram Dass in Maui (just a little name-dropping for ya), it lacked the continuity and growth that comes with ongoing community. Our teacher trainings in the last few years have aimed to connect individuals to a lively and regular sense of community – that “thing” that most of us are seeking in our lives. With the practice of yoga and mindfulness at the centre, our trainings have evolved to become transformative communities. Here’s where my jealousy comes in. This year, Leena and I have curated a Continuing Education program for yoga and movement teachers with some of the top teachers in Canada. All of them are leaders in their fields, and they are doing wonderful things for the world of movement education. We originally posted this article and ten tips about establishing a home practice on our blog in 2014. These tips are still relevant now, and with our building a home practice workshop around the corner, we have been thinking about home practice a lot lately. No matter who you are, keeping up a home yoga practice can be difficult at times. Heck, even our Yoga Teacher Trainees struggle with it sometimes! We showed our YTT’s this article on 10 Tips and Tricks to Establishing a Regular Home Yoga practice and asked them what they thought. This guest-post was written by Jason Spencer, a graduate of our 2015-2016 Yoga Teacher Training program. You can meet Jason as part of the team of teachers leading the Sunday 6pm Community Classes! This thoughtful post was written by Natalie Barrales-Hall, a member of our 2015-2016 Yoga Teacher Training (YTT). Natalie has worked as a community and youth worker, and in February she began teaching Queer & Trans Yoga at Queen Street Yoga. Natalie strives to facilitate safer spaces for students who may not see themselves represented in mainstream yoga spaces or those who may be questioning whether yoga is really for them. Her approach is gentle and permissive, and she invites students to consider a practice of gratitude and self-compassion. Whether emotional, physical or traumatic, I’ve been thinking a lot about pain. Maybe that is because of the injuries and losses I experienced during the course of the training program (don’t worry, it wasn’t the yoga asanas! ), or maybe it’s informed by my work and holding space for people who are hurting, or maybe it’s simply because pain is an inevitable part of being human. Whatever the reason, I’ve been thinking about it and in all my thinking, I’ve started to wonder about the stories we are told and tell ourselves about pain – pain as the cause of loss and disconnection, pain as a source of growth and healing, and what pain says about us and how we show up in the world. Queen Street Yoga had this question posed to us by a student and we want to respond to it. There is a big conversation about hands-on adjustments going on in the yoga community that includes conversation about teaching styles and qualifications, consent, and trauma awareness. 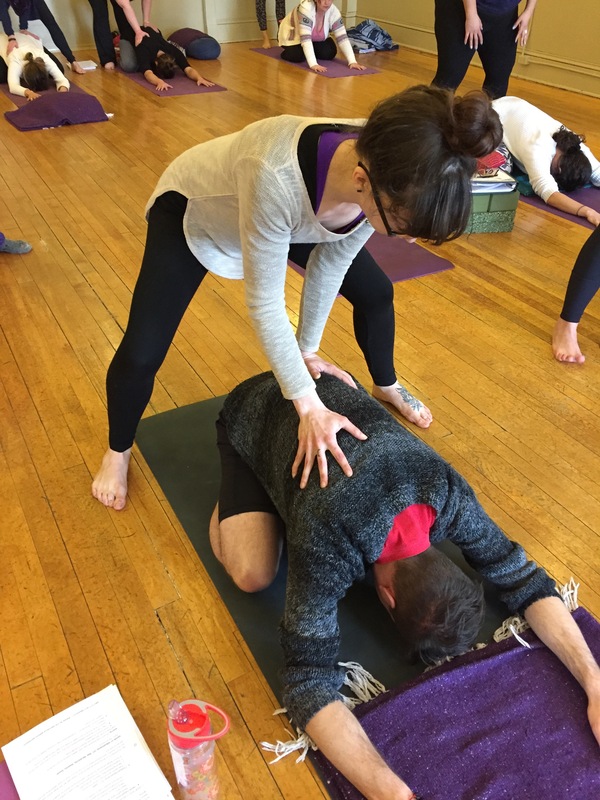 Emma is one of the Co-Directors of Queen Street Yoga, and this is her current thinking/reflecting around common assumptions about hands-on adjustments. We welcome your comments, feedback, and conversation around this topic. Assumption #1 – Yoga teachers are fully qualified and trained to give manual/therapeutic* adjustments.